Much effort has gone into estimating the size of the homeless population in South Africa. However, while data on the size of this population is critically important for designing interventions, it is only of use when we better understand the nature of the problem, maintain Candice Rule-Groenewald, Furzana Timol, Ernest Khalema and Chris Desmond. National census data on the homeless is almost non-existent. The official census conducted by Statistics South Africa has been found to be unreliable and unsuitable for establishing absolute numbers or trends in homelessness. Research estimates on the number of homeless individuals vary. Earlier research estimates ranged from 10 000 to 50 000 homeless people. More recently, the 2008 HSRC study of homelessness estimated a national homeless population of between 100 000 and 200 000, when taking into account homeless people living in rural areas. Establishing the absolute number of homeless people is vital. Equally important is how the concept of homelessness is understood for the development of relevant interventions to support this group of the population. The literature categorises homelessness according to three levels: primary, secondary and tertiary homelessness. Moreover, homelessness is defined by the patterns of time that individuals or families spend being without, or outside of, conventional shelters or housing. Homelessness may be temporary, episodic (over a short period), or chronic (permanent) (Figure 1). The way we conceptualise the idea of home and its opposite, homelessness, has implications for the development of relevant research, policies and intervention strategies to support the homeless. Should we define home as synonymous with house, shelter or dwelling, the homeless group of the population would then only include those individuals who were roofless. Actions to support these ideas of homelessness could then be restricted to providing shelter. If instead we were to define home as a secure, private place where residents are able to control its form and shape, then the idea of homeless communities could include a range of individuals such as those who were roofless as well as people living in informal settlements, temporary housing and those who accessed overnight shelters. Actions would then incorporate activities that supported a holistic perspective of homelessness. This would ideally include the creation of safe and supportive living conditions in addition to the provision of shelter. However, we cannot understand homelessness by only focusing on the concept of home or shelter. It is important that we also consider the psycho-socioeconomic drivers and outcomes of homelessness, particularly for the development of relevant interventions. These include factors such as substance abuse, family dysfunction and conflict, mental and physical health issues, and criminal affiliation. Among others, socioeconomic factors include poverty, unemployment, and a lack of social security and housing. 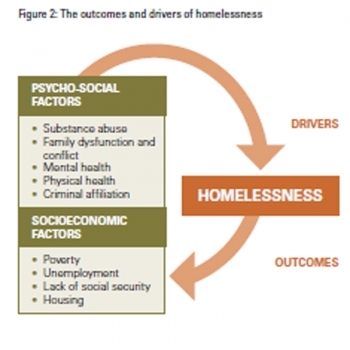 These factors may be both the drivers and outcomes of homelessness. By considering the contributing factors and outcomes, we are able to support the homeless through a range of interventions. 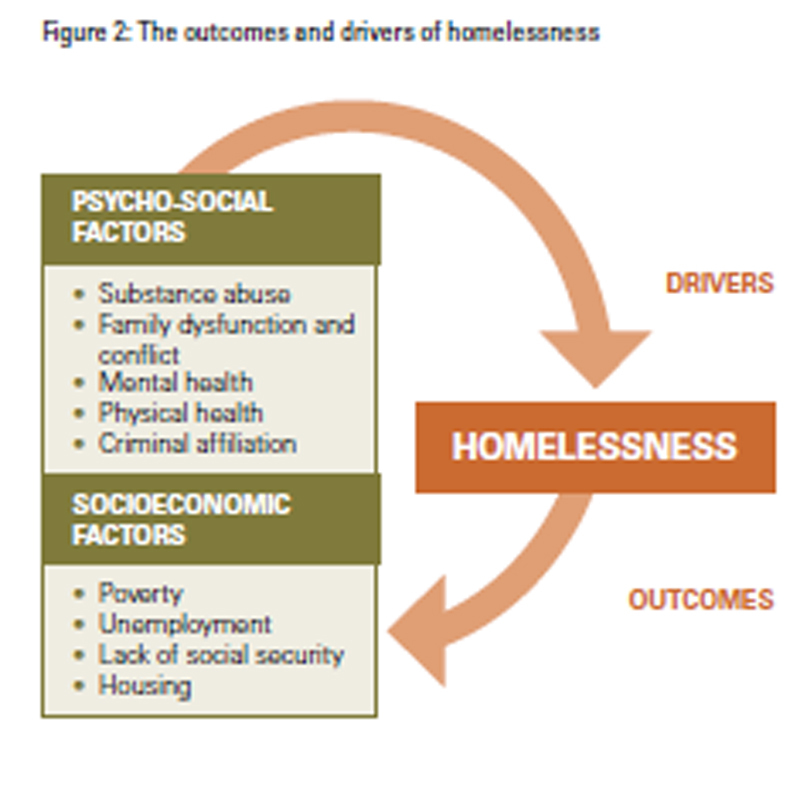 By considering both the contributing factors and outcomes, we are able to support the homeless through a range of interventions, such as treatment for substance abuse, provision of health and mental health services, skills development to facilitate job creation, shelter and housing, and reintegration (Figure 2). The appropriate balance between these interventions is determined by the prevalence of different contributing factors. Adopting simplistic definitions of homelessness may exclude certain groups. Homelessness is clearly a complex phenomenon. Adopting simplistic definitions of homelessness may exclude certain groups of the population and lead to under- or misrepresentation of the homeless population. Who we define as homeless and what we consider to be the drivers and outcomes of homelessness have a radical impact on the types of interventions we choose to employ to support homeless individuals. If homelessness was understood to be chronic and absolute, interventions would be targeted at the provision of housing and/or shelters for street dwellers. This would, for example, exclude those living in informal housing and those who were urban homeless but had homes elsewhere. If we consider homelessness to be a temporary situation brought about by substance abuse, interventions would include the provision of treatment facilities and transitional houses. This perspective neglects to consider the influences of psycho-socioeconomic factors. This review does not argue against interventions targeted at specific levels, drivers or outcomes of homelessness. Rather it argues that a targeted intervention alone, such as the provision of housing, does not meet the needs of all those who are homeless. The HSRC is currently working closely with the eThekwini Municipality to develop projects to explore homelessness in Durban. The HSRC, Safer Cities and the Municipal Institute of Learning (MILE) have therefore engaged in activities such as planning meetings, capacity building sessions and a one-day workshop with a wide range of stakeholders, including government departments, service organisations, faith-based organisations and homeless individuals. Authors: Candice Rule-Groenewald, researcher, Human and Social Development (HSD) programme, HSRC; Furzana Timol, junior researcher, HSD, HSRC; Dr Ernest Khalema, senior research specialist, HSD, HSRC; and Dr Chris Desmond, research director, HSD, HSRC.